Here a warm welcome awaits the traveler in the rural communities along the byway route. Aptly called the "Million Dollar View", this stretch of U. S. Route 1 offers travelers unsurpassed views of the Chiputneticook chain of lakes including East Grand, Brackett and Deering (all teeming with fish). Travelers can also view rolling hayfields, Mount Katahdin, Peekaboo Mountain and the landscape of New Brunswick, Canada. Travelers may spot local wildlife including bears, deer, eagles, loons and moose. Scenic turnouts provide front-row seating for the vast and impressive views to the east and west. Danforth, a former lumber town in the Baskahegan River Valley, marks the southerly limit of the byway and provides many small-town amenities. Weston is the location of an historic portage used by Native cultures and early settlers connecting Baskahegan Stream to Butterfield Landing on East Grand Lake. Weston also has many interesting historic buildings such as the Weston Community Church, which was moved across the ice of East Grand Lake from Canada, as well as modern accommodations of the First Settler’s Lodge. 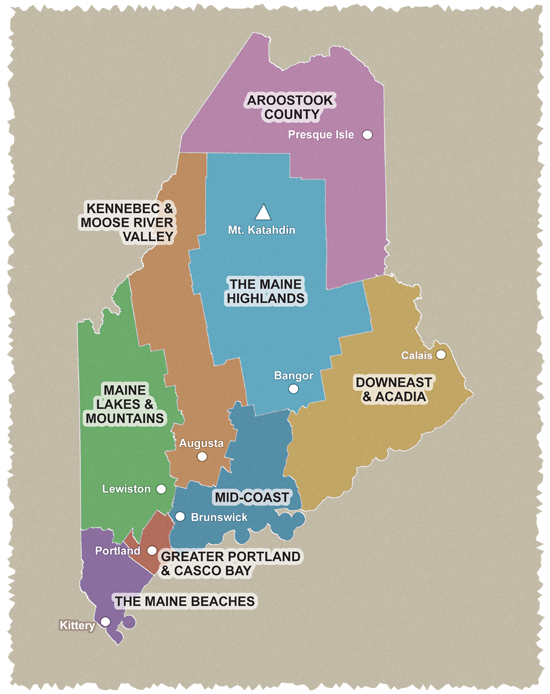 The byway reaches its high point near the top of Peekaboo Mountain, and travelers may continue north to explore Aroostook County or enter New Brunswick, Canada, through Orient’s border crossing.